Valve manufacturer Crane ChemPharmaFlow Solutions has launched the new Saunders Exelon range of diaphragms for its Industrial Diaphragm Valves. The new diaphragms provide performance advantages in handling chemically aggressive slurries such as those found in mining, titanium dioxide, phosphate processing and similar applications. 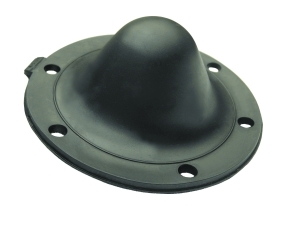 The first product, Saunders Exelon XA diaphragm, developed in-house by the company’s team of polymer scientists, introduces a new diaphragm material – a compound based on an ethylene propylene (EP) technology – designed specifically for the handling of chemically aggressive slurries. 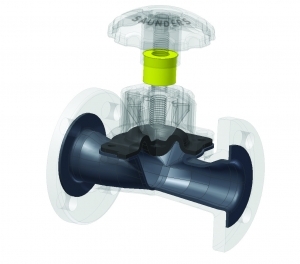 The new diaphragm is 100 per cent compatible with all existing IDV Saunders product ranges and is available for both new installations and for diaphragm replacements in existing Saunders valves. Exelon XA diaphragms provide improvements in three key aspects of solids handling – enhanced flex life, resulting in reduced down time and improved productivity; 70 per cent improvement in elastic recovery, resulting in better sealing performance and reduced emissions; and maximised rebound resilience, leading to improved erosion resistance – while maintaining the same high level of chemical resistance as previous Saunders EP and butyl based diaphragms. As a result the diaphragm lasts longer in processing slurries and offers significantly improved performance for minerals and materials applications.